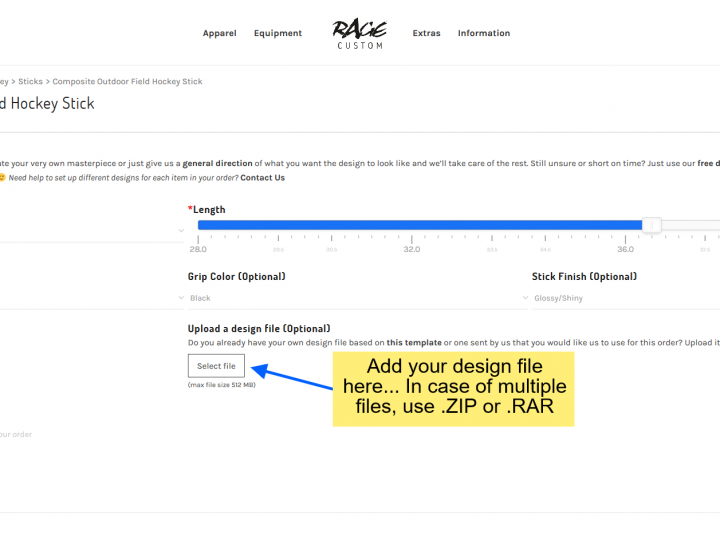 If you are ready to design & order personalized sports goods, here are a few basics that you might find helpful! No, you don’t have to be a design guru (although if you are, you can use these blank templates & use your favorite design software to create something special) to plunge into creating personalized items because our design interface is quite simple, comes with a Guided Tour when you first visit a product page and only requires a few steps to come up with something truly original. Also just a reminder, you can always use our Free Design Service if you are unsure about designing, need help to refine the edges or are simply short on time. Our design team would love to help but if you are in a DIY mood, then read on. To make this experience easier for you, we are sharing the “how to” of various steps a customized design entails. Let’s go! In the “Top Menu”, you can browse through our collection of customizable products and click on the item of your choice. When you click on a product’s thumbnail you will see the design editing page and the editing dashboard on the left side. Click on the “Add Text” tab or simply double click on the text visible in the design panel to add/edit your text. When you select a piece of text, a features panel will pop-up which allows you to choose from a number of text editing options like font, size, style, and color. You can customize this text both on the front and back side of the product. For instance if you are customizing a hockey stick, you can add text on the round and flat side up to your preference. Not happy with the text you entered? You can undo or delete it also! Easy, right? Now that you have edited the text, it’s time to primp up your product a little! The first option is to change the color from within the Layers Tab, as shown below. Secondly, you can also click on the product itself, and you will see a tab with two options “Fill”, and “Reset”. Click “Fill” and choose from the spectrum of various shades. You can also change the transparency of shade from the drop-down “Fill” menu. Once you like a hue, it’s always wise to note down the code in case you are up for designing your sports kit around a same theme or color. Does the design still look quite plain? Read on! If you would like to add any graphics like logo files etc., we got you covered! On the editing dashboard, go over to the tab titled “Add Image”. Drop the image file(s) (JPEG, PNG or SVG) on the upload zone or click it to open the file-picker window. Once your image uploads you can drag, transform and reposition it from the drop-down menu below the image. Resize it according to the width of your product and voila! You have your personalized item ready! Looking for more options? Our built-in design library has tons of options for you. Select the “Choose From Designs” tab on the dashboard and browse through our collection of pre-built designs! Z1 Artistic Brushes – Your go-to option for contemporary graffiti based designs. Z1 Geometric Shapes -A library to accentuate your design with the classic geometrical shapes. Z1 Graphic elements – Similar to Artistic brushes but with a greater design variety. For a few products like field hockey sticks, there are additional theme-based options like comics, country, simple, and textured. These will differ on a product to product basis. Our “Manage layers” option is designed keeping in view the arrangement of the graphics. Move over to the “Manage Layers” icon on the dashboard, and drag the different objects up or down to layer them to suit your needs. Need a bit of help to perfect your design? Download the design or share the Design Link with us and we will take care of the rest. Contact us and our design team will be happy to help you from design to dispatch. 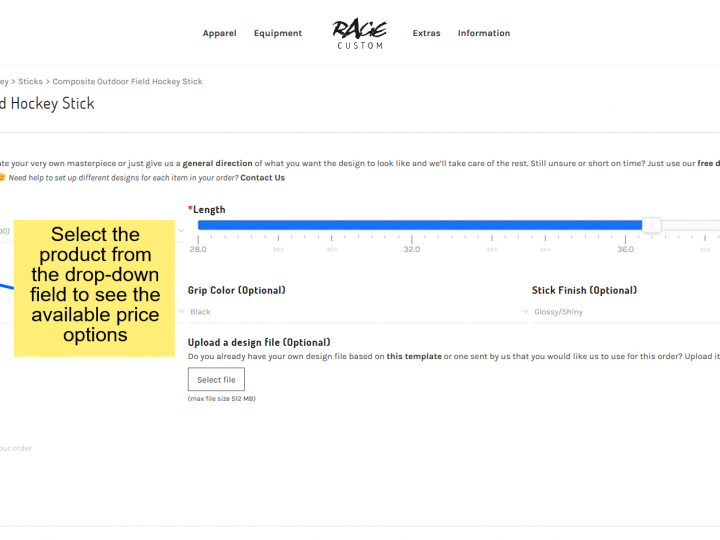 All the products follow the same design dashboard and guidelines with effortless and simplified steps. If you still have any question or would like something added to this design guide, let us know in the comments below! Happy designing!